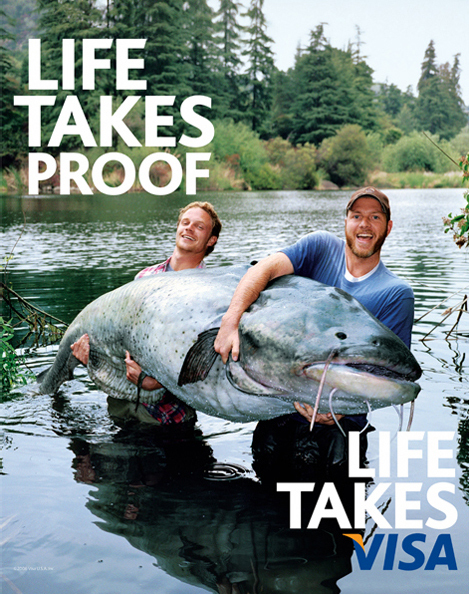 When VISA needed a gigantic size-record breaking catfish for a print ad, they knew that it'd be an iffy proposition to actually find a live one. Even if they hired a team of professional fisherman and sent them off to varied locales, each with his own photographer and crew, there was no guarantee they'd capture a beautiful image of a huge one. Luckily, they had the idea to create an "arti-fish-al" replica, and they came to the right place! We began by creating an armature and sculpture for an 8 foot long behemoth, making a HUGE silicone and fiberglass mold, then creating a silicone skin, which was then backed up with flexible polyfoam. Our master painters put the proper spotty, froggy, bloodshot finish to the creature, who was made to appear that he'd been banged about in the many years he'd been ruling his lake, uncaught...until now! The final replica weighed almost 200 lbs. The goal was to make it slump and bulge realistically, so that the models would have something substantial to actually heft about. That's where the silicone came in, which gave it the proper weight and limpness, while also giving it that glistening fishy/amphibian translucency. See how we documented the work in progress here.